Even More Vintage Summer Menswear For #SS18! Last week’s blog proved a big hit, with many of you taking advantage of our discount code to save 10% on summer menswear. We’re continuing the fun this week by offering even more new #SpringSummer18 deals. All of these items are perfect for a weekend away, a summer holiday, or even a music festival or day out in the UK. Just type in SUMMER18 at online checkout to get a 10% discount on everything in this blog post. Diesel have dominated our denim collection for over 15 years, with a consistent range of vintage Italian jeans at a very affordable price. We’ve recently started running Diesel denim shorts in Light Blue (pictured) and Grey. Just like the regular Diesel jeans, these shorts boast a comfortable stretch fabric which makes sitting down and stretching just as comfortable as when you’re on your feet. 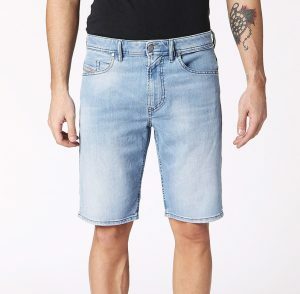 Perfect for guys who like to wear denim on holiday without the hassle of wearing jeans. Even more comfortable is this loopback cotton sweat short by Lyle and Scott in four colours: Seashell White (pictured), Navy, Mid Grey Marl and Mist Blue. It’s a seasonal classic that has gained in popularity over the last few years; our regular customers rave about it. The loopback design means the interior is soft and cool against your legs. Ideal for casual wear this summer with Lyle and Scott’s new slides. 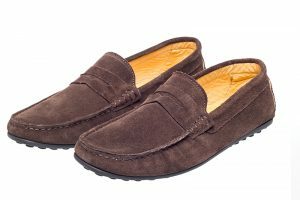 This brand new suede Moccasin slip on, designed by Northampton shoemakers John White, is truly a class apart. More than a few customers have commented on the beauty and softness of the high grade suede fabric, made with the utmost care in Italy by expert craftsmen. Worn usually with tailored shorts with invisible socks to complete the summer look. 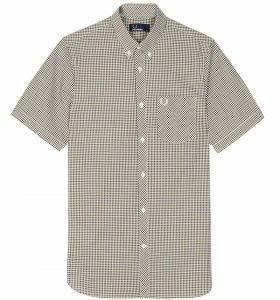 This three colour Gingham by the heritage masters at Fred Perry is a fantastic summer menswear option. Made from a soft cotton poplin fabric that will stay cool and crisp even in the sweatiest summer climes. 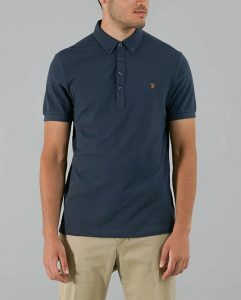 Subtle touches like a chest pocket and cross-cut placket demonstrate Fred Perry’s keen attention to detail. Available now in two colour ways: Nettle (pictured) and Dark Carbon. There’s no more important accessory at summer events than something stylish to cover your head from the sun. In the last year we have partnered with Failsworth, a historic British brand who specialise in vintage headwear. 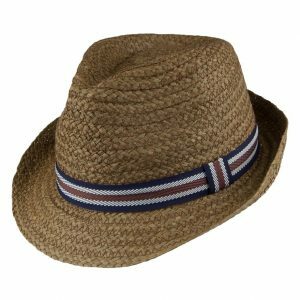 This stunning trilby hat is a steal at only £30, made with high quality Raffia straw fabric. Stylish, well made and affordable — all our criteria for quality rolled into one. Farah has risen like a phoenix to become our fastest growing brand in recent years. Every season they wow our customers with simple vintage designs made with impeccable taste, such as this classic Pique cotton polo. Cut in Farah’s signature semi-slim fit, the Merriweather short sleeve polo is available in four colours: New Navy (pictured), Light Pink Marl, True Navy, and Lake Blue Marl. Don’t forget to use the offer code SUMMER18 to claim 10% off everything in this blog!